Which are the Best Cities to Buy Real Estate? Prices in the housing markets in America have flattened out this winter. That’s good news for buyers. In fact, for rental property investors, some believe you can’t lose with rental property, no matter which way the economy goes. When you add the Fed’s new dovish interest rate intent, lower inflation, banks wanting to lend, and trade talks going well, 2019 might be the best time to buy a house, condo, or invest in income rental properties. Best to choose soon, before prices rise. And choosing the right city is still very important if capital appreciation, cash flow, and ROI are what you’re hoping for. 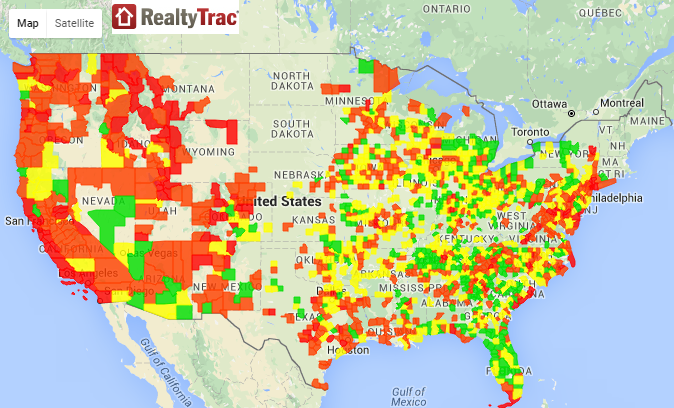 Are prices too high in your Florida, Seattle New York, or California community? Then find hundreds of other high potential cities enjoying excellent growth right here. Stressed out renters in Los Angeles, San Jose, and San Francisco are migrating inland in search of homes or apartment rentals. You’ll find the cities with the best price to rent ratios below, but there’s much more to consider. Use a spreadsheet to review each of the factors. The Wealth Network says the ideal cities that offer the best cash flow and equity growth often have three things in common: job growth, population growth and affordability. Which cities and states offer the best employment outlook, lowest taxes, fewest regulations, large millennial population, and a pro business climate? Florida, California, Michigan, Colorado, Miami Florida, Boston, Bay Area, New York , Massachusetts, or is it Ohio and Michigan? See Landlordology’s list of state regulations before buying a home or multifamily portfolio. Your first thought on income properties is California, yet migration is outward into Arizona, Texas, Nevada, Colorado and even Oregon. The lower cost of doing business, lower taxes, and lower residential property price savings in other states is substantial. A growing number of sellers in the Bay Area are selling while prices are good. Dallas, Houston, Austin, San Antonio and Fort Worth are getting special attention these days. Texas is growing and Austin has become a tech hub. Michigan has huge potential. Businesses are relocating to these cities for a lot of reasons. The US trade situation is foremost to consider. A global recession would impact the US short term which is why President Trump is talking with China. If he protects US business, then heartland cities will continue their growth and the overheated markets may cool. High oil prices, rising interest rates, stock market crashes, can all dry up jobs and create rental vacancies. In this era of investment, the best property investments may be in other cities. Even if you intend to stay close to home, knowing what’s going on in other states might provide a superior return on investment. And while 30% to 40% returns aren’t the norm anymore, the stock market and economy could return to their heights of 1 year ago. The demand for rentals is still intense as the housing supply problem hasn’t been solved. And there are few signs of booming construction to ease the problem in many regions. Make sure others learn about the once in a lifetime opportunity in real estate investment with rental properties. Growth in rental demand was largest for people with incomes lower than $25,000; a group that accounted for four million new renters over the past decade. Growth for people with household incomes over $50,000 accounted for 3.3 million new renters. There was an increase of 1.6 million renters for those with incomes over $100,000 a year. Vacancy rate was less than 5% in 75% of the United States largest cities by 2015. With crazy high ROI, we’ll see rental income investors and developers race into these regions to build new properties. It’s a great investment situation for Americans, investors and realtors. San Francisco is one area however that might not benefit. Its strong economy is driven by large tech corporations that add value to imported technology and products manufactured in China. Which is why Silicon Valley is hostile to Trump. 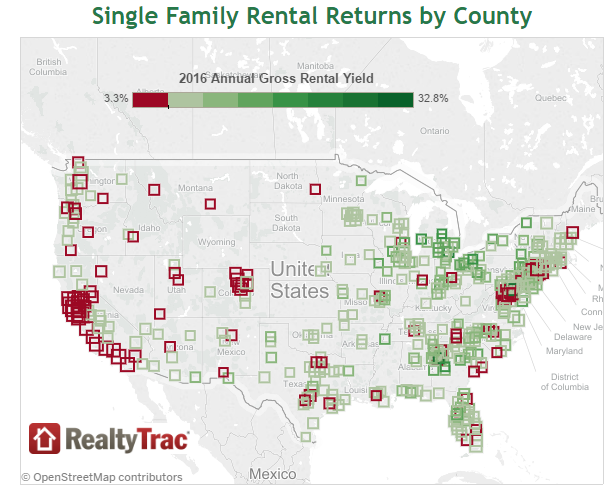 California’s economic outlook is still very bright, but it’s low potential rental income outlook could send investors over to other US cities to invest in, such as those in green areas in the charts below. With or without Trump, the US economic outlook is good. The outlook for rental income property is exceptional. Realtors and investment advisors should be looking hard at this market. Even baby boomer investors are looking at the potential of retirement income. Many baby boomers are a little nervous about how they’ll fund their “stay put” retirement plans. They’ll need extra income to stay put and revamp their home over the next 30 years, and they may look to rental income to get that money. A percentage may just sell their home and leave it to a developer/investor to turn it into the multi-family unit. That investor might be you. Complicating your investment decision is another set of statistics from Realty Trac that shows the west still has the highest returns currently but the green zones are predicted to perform better. How about a 32% Yield on a Single Family Home? These converted stats in this chart from Smart Assets are very insightful. They used U.S. Census data, to calculate the price-to-rent ratio in every U.S. city with a population over 250,000. 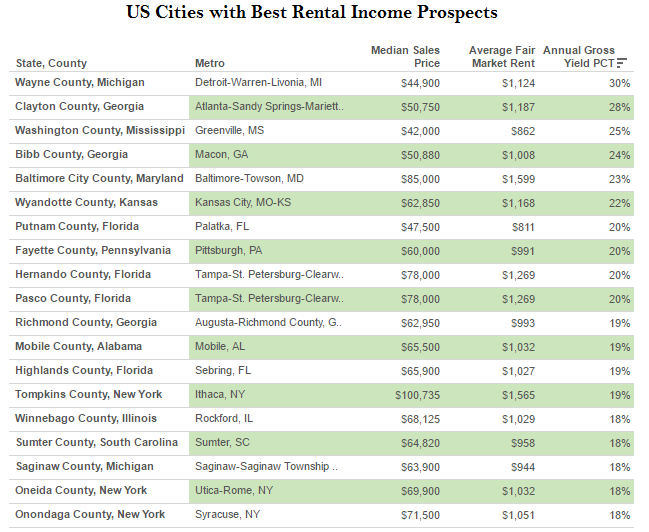 This is their list of 80 US cities below with the worst potential for rental property income investment appearing at the top (The ones at bottom such as Detroit have better potential, unless employment fails to recover in Michigan). What About the Local Economies? 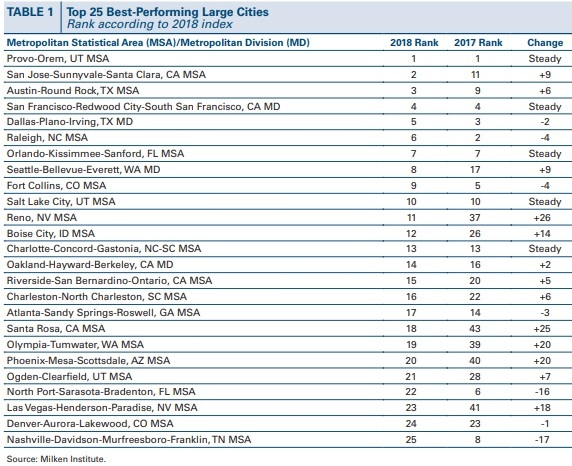 Last year’s report from Millken research reveals the cities with the best performing economies in 2015. This was put out in December 2016. 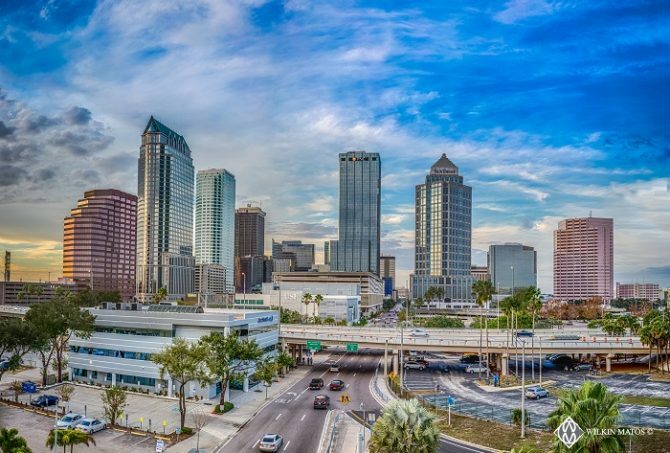 Florida cities are showing a marked rise. Recent reports focus on the apartment rental prices in San Francisco, Sacramento, and San Jose as offering outstanding returns for investors. 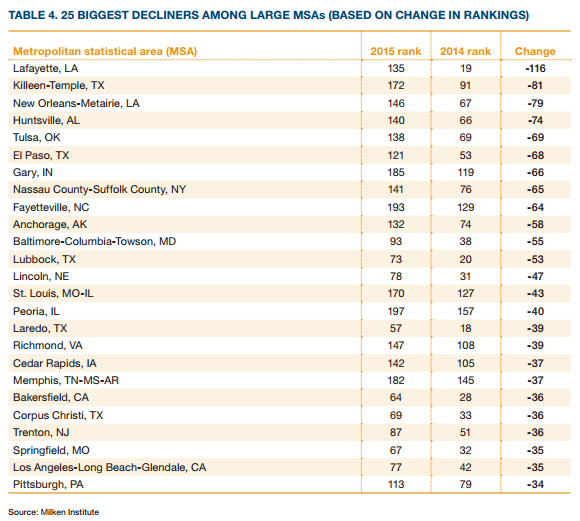 And this is Milken’s list of worst performing cities, likely the ones you might avoid. In this video below, Mike Hambright talks about apartment rental markets, and how to make money from cash flow and property value appreciation. There are so many real estate investment opportunities in the US and in Canada too. Hopefully, my amateur US housing forecasts, predictions and unguaranteed advice will help you find those opportunities for the best upside in cash flow, safety and equity appreciation. Be careful with any investment. Do your due diligence. San Francisco Apartment Rentals | Amazon | Top Stock Picks for 2019 | FAANG Stocks | Student Housing Investing | Buying Homes in Los Angeles | Luxury Homes in San Diego | Beautiful San Diego | Best Travel Destinations | Toronto Real Estate Forecast | Sell Your Home | Costa Rica Vacations | Video Real Estate Production | Home Mortgages | Digital Marketing Services | Mississauga Real Estate Forecast | Buy Luxury Home in Costa Rica | Retire in Costa Rica | Best Cities by ZIP Code | Rental Income Property | Real Estate Investing | Homes for Sale | When is the Best Time to Buy a Home? Decent article, all except for the political comment about how Trump will almost certainly be elected. Your choice to place that in the article betrays your contempt for your reader and your stance against human rights. Sickening. Well…Trump was most certainly elected, so it actually proves that this author has incredible foresight. I would trust whatever he says about investment markets because of that gutsy call back in late October / November, when everyone was saying Clinton had a 70% chance of winning. Now it is time to make America Great Again. That’s all…. Thank you. This is so much of the information I was looking for, all in one place! Thank you for making a list of best cities in the US to buy real estate properties for rental! This is very informative for people looking for new real estate properties for investment. Amazing ! Thanks it helped a lot. I think it would be helpful to incorporate the impact of rent control coming into numerous markets in California. The SEIU is trying to get the most stringent rent control measures on 17 different municipalities this year. Rent control will dampen your returns as elected or appointed boards will be allowed to set rates for new projects and regulation will stifle annual increases to cpi. In Sacramento, the measure would actually be appended to the City charter.